There were few residents in the northern edge of Black Rock at the end of the nineteenth century. The people that did live in the area were a mix of Germans, Irish, Poles, and Swedes. As Pan-American land speculators began to liquidate their holdings around Hertel, Poles looking for a good deal swooped in and purchased many of the lots. As they built their homes the predominantly Galician Poles had few options for their religious needs. They could attend the English services at Holy Spirit or travel over two miles including a crossing at the belt line, and go to Assumption. Instead of those options, they decided to chart a third. On August 17, 1917 at Jaroszewski’s Hall on Hertel a committee was formed to establish a new church, calling itself the St. Florian Society. With the help of Father Hordych of Assumption Church, the society approached the bishop on September 1st about establishing a new Polish parish in North Buffalo. The bishop quickly agreed, sent Father Francis Wasik to Black Rock, and on September 16, 1917 the first Mass of St. Florian’s parish was held in the store of Stanley Luczak. The new parish selected a site on Hertel for their new church and soon began raising funds. They hired Wladyslaw Zawadzki to design their combination church and school building. The cornerstone for the crimson brick church was laid July 7, 1918 and the completed structure with classrooms on the first floor and church on the second was opened with a Mass on February 2, 1919. That September, three Felician Sister taught the first classes. The second pastor, Father John Szymtkowski would see St. Florian’s through the Roaring Twenties, the Great Depression, and World War II. As the church grew, so too did the community around it. Dirt roads were paved, School 79 opened, and the parish grew to 650 families. With so many families St. Florian’s next pastor, Father Klukaczewski began raising funds for a new church. The parish also received a decree to change its status from a Polish ethnic parish to a territory parish. By 1960, $116,000 was in the new church fund and architect Joseph Fronczak was hired to design the building. The unexpected death of Father Klukaczewski in 1961 would mean the rest of the project would be overseen by Father Andrew Pronobis. The former army chaplain got to work right away, breaking ground on the new house of worship in June of 1962, blessing the tower, holding the first Mass in August of 1963, and preparing for a dedication date in spring of 1964. With only four months to go, Father Pronobis suffered a stroke and passed away in January 1964. The next month Father Boleslaus Wendzikowski was placed in charge of completing St. Florian’s. On May 3, Polish Constitution Day, 1964, Bishop James McNulty dedicated the finished church. Saint Florian’s was a stable parish for much of the rest of the century. Like many city parishes, the school was closed in the 1980s, but the parish as a whole maintained a sizable congregation. 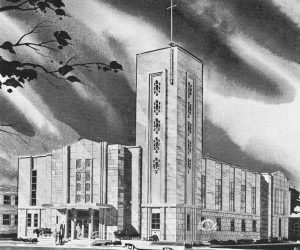 At the dawn of the new millennium the Diocese of Buffalo began to consolidate parishes and St. Florian’s was one of the churches selected to close. On October 28, 2007, Father George Maj celebrated Mass at the church for the last time. The stained glass windows of Polish and popular saints were removed and the building was sold. There were few residents in the northern edge of Black Rock at the end of the nineteenth century. The people that did live in the area were a mix of Germans, Irish, Poles, and Swedes. As Pan-American land speculators began to liquidate their holdings around Hertel, Poles looking for a good deal swooped in and purchased many of the lots. As they built their homes the predominantly Galician Poles had few options for their religious needs. They could attend the English services at Holy Spirit or travel over two miles including a crossing at the belt line, and go to Assumption. Instead of those options, they decided to chart a third. On August 17, 1917 at Jaroszewski’s Hall on Hertel a committee was formed to establish a new church, calling itself the St. Florian Society. With the help of Father Hordych of Assumption Church, the society approached the bishop on September 1st about establishing a new Polish parish in North Buffalo. The bishop quickly agreed, sent Father Francis Wasik to Black Rock, and on September 16, 1917 the first Mass of St. Florian’s parish was held in the store of Stanley Luczak. The new parish selected a site on Hertel for their new church and soon began raising funds. They hired Wladyslaw Zawadzki to design their combination church and school building. The cornerstone for the crimson brick church was laid July 7, 1918 and the completed structure with classrooms on the first floor and church on the second was opened with a Mass on February 2, 1919. That September, three Felician Sister taught the first classes. The second pastor, Father John Szymtkowski would see St. Florian’s through the Roaring Twenties, the Great Depression, and World War II. As the church grew, so too did the community around it. Dirt roads were paved, School 79 opened, and the parish grew to 650 families. With so many families St. Florian’s next pastor, Father Klukaczewski began raising funds for a new church. The parish also received a decree to change its status from a Polish ethnic parish to a territory parish. By 1960, $116,000 was in the new church fund and architect Joseph Fronczak was hired to design the building. The unexpected death of Father Klukaczewski in 1961 would mean the rest of the project would be overseen by Father Andrew Pronobis. The former army chaplain got to work right away, breaking ground on the new house of worship in June of 1962, blessing the tower, holding the first Mass in August of 1963, and preparing for a dedication date in spring of 1964. With only four months to go, Father Pronobis suffered a stroke and passed away in January 1964. The next month Father Boleslaus Wendzikowski was placed in charge of completing St. Florian’s. On May 3, Polish Constitution Day, 1964, Bishop James McNulty dedicated the finished church. Saint Florian’s was a stable parish for much of the rest of the century. 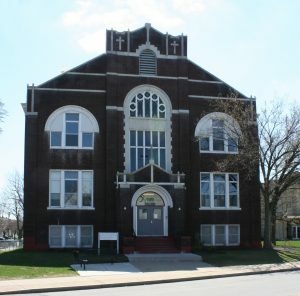 Like many city parishes, the school was closed in the 1980s, but the parish as a whole maintained a sizable congregation. At the dawn of the new millennium the Diocese of Buffalo began to consolidate parishes and St. Florian’s was one of the churches selected to close. On October 28, 2007, Father George Maj celebrated Mass at the church for the last time. The stained glass windows of Polish and popular saints were removed and the building was sold. Saint Florian's Church, Buffalo NY. South Hackensack, NJ: Custom Book, 1968. Print. St. Florian Church Final Mass. Buffalo, NY: Donald J. Siwek Funeral Home, 2007. Print.